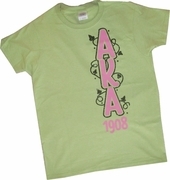 Glittery Ivy Vines wrap around the playful letters on this tee. So pretty! Choose a ladies' cut or unisex cut tee and even upgrade your regular tee to long sleeve!